Wolf’s Military and Commercial Division is developing a Digital Smart Glove for the U.S. Air Force. The new high-tech glove enables the pilot and mission crew to communicate and to control switches and annunciator panels by using hand and finger motions that are translated into voice and text commands or interpreted as actionable geo-registered icons of real world objects. During flight, pilots and other crew will no longer need to take their eyes off the battlefield situation in order to communicate, control radio transmissions, or interrogate and manipulate certain switches. The Digital Smart Glove uses an integrated sensor system to recognize and interpret independent hand and finger motions while maintaining the same form, fit, comfort and functionality of the original military specification flight glove. The sensor suite is capable of sensing the local bending and motion of each individual digit, as well as the global orientation and motion of each hand in geo-registered coordinates. The result is the ability to recognize individual finger or hand gestures and coordinated gestures between the fingers and parts of both hands. 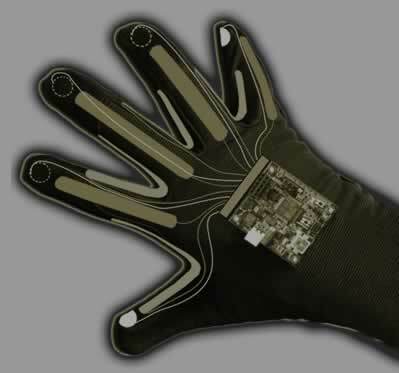 A microprocessor embedded in the glove interprets the syntax of the coordinated gestures and initiates the appropriate communication or action. The new gloves enable communication of a complex set of commands between crewmembers, touchless selection and annotation of switches within the aircraft, and external communication across a low-bandwidth battle network. Two-way communication and interrogation of switch status are augmented with tactile or aural feedback. The gloves can also discriminate gesture vocabularies such as American Sign Language and typing motions on a keyboard in both military and civilian applications.